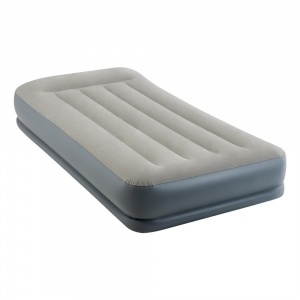 Intex 64116 Single Size Pillow Rest Mid-Rise Airbed with fibre-tech construction. These airbeds provide all of the benefits of the pillow rest range but with the added advantage of lighter weight and easier portability. The beds feature contoured bases which provide a better gripping effect and increase stability. Perfect for travellers who are looking for all of the comforts of a raised bed, plus the convenience of easy transportation. - Quality tested 21.2 gauge waterproof flocked top and with 15 gauge vinyl sides and bottom. - Flocked sleeping surface for extra comfort. 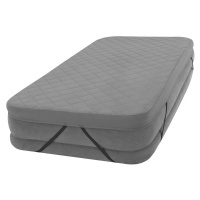 - Mattress is raised 12'' from the floor for convenience. - A built-in pillow provides bed like comfort. - Built-in Electric Pump for quick inflation and deflation. 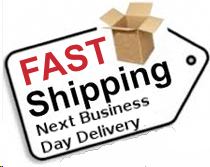 - Mattress approximate maximum dimensions 39'' x 75'' x 12". - Weighs approximately 4 Kg.